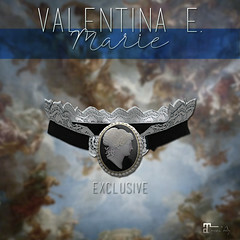 June 2017 – Valentina E.
NEW! Valentina E. The World Is My Lobster Ensemble @ UBER! Out now at the latest round of UBER the new Valentina E. Lobster Skirt and Knotical Top, exclusively for Maitreya Lara! Available in four color options only at this special event. NEW! Valentina E. Rosie Dress @ Chapter Four! NEW! 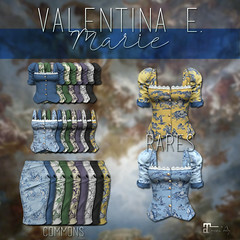 Valentina E. June Dress @ FaMESHed! Out now at FaMESHed the new Valentina E. June Dress! This silk dress features a semi sheer over lay glittering with rhinestones. Available in four finishes exclusively for Maitreya Lara. Inspired by evening garden parties and wedding events. Demo available at the event and inworld. NEW! Valentina E. Poppy Ensember @ UBER! Out now at UBER the new Valentina E. Poppy Laced Top & Laced Skirt! Wear together or separately. Available in four color options exclusively for Maitreya Lara. Don’t miss the laced back on the tee! Demo available at the event and inworld.